8th Street Bridge: New and Improved! Since I have decided to make more of an effort to update our blog, I thought I'd revamp it a little bit! I'm not too blog savvy, so I'm sure there is a lot more I can do to make it "pop", but this is good enough for now! Our friend Todd is in town, and he and Jason joined a large gr oup from Dallas to go tubing down the Guadalupe River today. I was supposed to be going, and even made plans to have the day off of work to join in the festivities, but I was not feeling very well this morning. I made the decision to stay at home, instead of going with the gang to float down the river. They were also planning on spending a night bar hopping in Austin. And I was definitely not up for that! It will probably be the last time we would've gone this summer, so I'll just have to wait until next year! I laid low for most of the morning and by the afternoon I was feeling great! I hopped in the shower and decided to treat Charlie Brown and Flippy to a good time at the dog park. After gathering all of their things together: towels, shampoo, leashes, treats, water, waterbowl, etc. I got them into the car and off we went. It's like having children I tell ya! They were so excited once we got to the park. There are two separate parks: one for small dogs under 20 pounds and another for the bigger pups. Since I was by myself I opted to take both dogs into the park for the bigger dogs. After all, Flippy thinks he weighs 100 pounds! Charlie bolted off as soon as we got into the park, but Flippy was a little timid and decided to stay very close to mommy the whole time. Charlie had a blast! He greeted every human and dog in sight and was bounding around with all the energy in the world! Flippy was more cautious, but followed behind his big brother everywhere he went. There is a huge dog boned-shaped pond at the park, but thankfully neither one of our boys wanted to go for a swim. Charlie is not much of a swimmer, and Flippy has only dared to jump into the water on one occasion. There is also a really nice agility course, walking trails and woods to explore. It really is a great place to take your dogs. To cool down Charlie would lay underneath a shaded pavilion. Unfortunately for me it was fairly muddy and he was covered in dirt by the time we left. Flippy was also a little dirty, but mostly because he is so low to the ground and will kick mud up on himself while walking. Thankfully I had brought towels and shampoo. There are showering stations for the dogs to wash off at and both of my boys needed it! I have no idea how I managed, but I was able to successfully bathe both of these wiggle monsters without too much trouble. 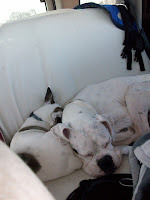 Once we were back in the car, they both laid down in happy exhaustion. I believe Flippy was asleep in less than two minutes! We came home and had some lunch/dinner and relaxed with a movie. I think in a few minutes here we'll head off for a nighttime walk. In a way I'm glad I didn't go to the river, because I was able to spend a day of quality time with two of my favorite boys. I will be happy to see Jason when he comes home tomorrow. I always miss him when he is away.